Okra also commonly known as lady fingers is a power house vegetable. It is packed with vitamin C, K and folate. In addition, it is rich in anti-oxidants which can protect against cell damage in our bodies. It sits proudly amongst other vegetables which are very high in fibre and as a result help maintain a healthy and regular gut in addition to helping regulate blood sugar. Those whom have had okra cooked as a stew or soup immediately connect it to a slimy texture. True it is one of those vegetables but there are hacks to reduce the sliminess, a few I have mentioned in my tips below, but I am sure there are many more which I would love you to share with me. In the Levant there are two traditional methods of cooking Okra, either with lamb chunks and tomatoes or with tomatoes, coriander, garlic and an acid. But off course many countries have different styles of cooking it and this recipe is inspired by Indian flavours, which really elevate the vegetable leaving you with a delicate blend of spice, aroma and flavour. Choosing young, small and tender okra will take less than 20 minutes from pot to table. That is how I like my food, quick, easy and healthy. * Cut the tip of the okra without cutting into the pods and wash.
* Peel and cut the onions, garlic and ginger and process in a food processor to a paste or grate it by hand as in my tamarind chickpea recipe. Do the same with the fresh tomatos or chop small. * Toast the coriander and cumin seeds then crush in a pestle and mortar as seen in my tamarind chickpea video. 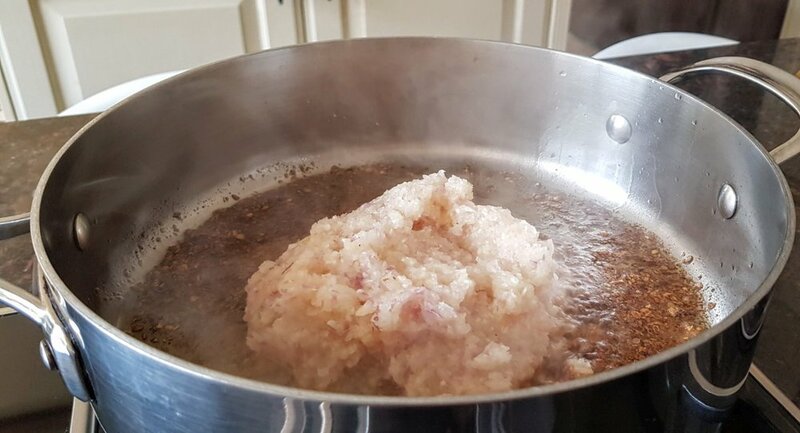 * Heat the vegetable oil in a pan and for a few minutes sauté the toasted crushed coriander seed, cumin seed and the pureed onion, ginger and garlic paste. * Add the turmeric, chili, pureed tomatoes, tomato paste and stir. * Add the Okra, salt, pepper and enough water to cover the Okra. Cook on medium heat covered until okra is soft and still in contact. * At the end of the cooking add the tamarind sauce and freshly chopped coriander and adjust the salt. The final dish should have a thick sauce where it can easily be eaten by hand with fresh chapatti. * Choose pods that are small and tender. * They can be stored in the fridge for up to four days wrapped with paper towel. * When Okra is cooked it can become slimy, you can avoid it by sautéing the okra on high heat before hand or cooking it with an acid like tomatoes as in the recipe. Try to keep the okra whole as cutting it or over cooking it releases the slime. Per Serving: 320 Calories; 15g Fat (39.7% calories from fat); 9g Protein; 42g Carbohydrate; 10g Dietary Fibre; 11mg Cholesterol; 406mg Sodium.